Pinball Wizard is a game invented by Margaret Hendershot, played for the first time at a TDAA trial in Washingtonville, OH in July, 2009. The game seems a bit like Dare to Double, but with some important differences that the canny competitor should appreciate. The goal is to accumulate as many points as possible within course time: 50 seconds for big dogs and 55 seconds for small dogs. The start obstacle is the dogwalk; in either direction. After successfully completing the start obstacle, the team continues to accumulate points by completing obstacles of the handler’s/dog’s choosing. All scoring obstacles may be completed twice for points; triggers and bonuses can be taken many times. No obstacle may be taken back-to-back. The table is always live. If the dog touches the table it is a tilt and play ends. Once the start obstacle has been completed, the triggers become active. Triggers open the bonus obstacles allowing the dog to triple all points earned. The bonus is the two tunnels marked bonus, in any order and any direction. The bonus may be earned three times during play. The successful completion of the bonus triples all points accumulated each time it is completed. To reactivate the triggers after completing the bonus, at least one point must be earned. A whistle sounds at the end of point accumulation. The dog should be directed to the table to stop time. jumping the trigger when it is not active. Knocking a trigger bar means that trigger is out of play for the rest of the game. The remaining trigger may still be used. Pinball Wizard is scored Points, Then Time. It’s true that this game feels a lot like Dare-to-Double as the dog gets to multiply points previously earned multiple times. An important difference between the two games is that the dog is penalized for any fault in Pinball Wizard by having to repeat the time-consuming/zero value start obstacle (the dogwalk). It would be fairly easy to lose heart on any fault, knowing that your strategy has unraveled and your dog probably won’t be able to earn the points to qualify. Your dog will not be the only dog to fault in Pinball Wizard. There will be a bunch of faults out there. What differentiates the field of players at the Petit Prix is the ability of the handler to pick himself up and go on. The fault wasn’t crushing. Melting down on a fault is crushing. The key to a dog’s choice game is that it should be resolved to a plan as clear and precise as any numbered course. Plan to run without fault. This strategy requires the dog to do trigger and bonus only twice. The dog needs to begin with a minimum of 17 points to get to a GIII qualifying score. Three bonuses will surely yield more points than only two. The burning question shall be… how many points should be scored before engaging in the bonus strategy. 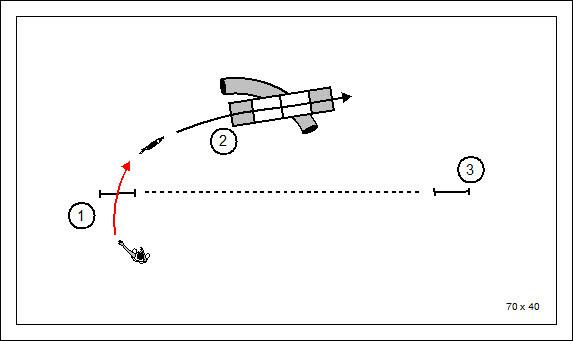 In this strategy the dog begins with only six points, and picks off a single point before returning to the trigger and bonus. Note that this can be done with a fairly economical 12 obstacles, raising the possibility that the trigger and bonus might be approached a fourth time. This strategy is a bit more ambitious. Not only does the dog begin with 12 points, but gets more transitional points between trigger and bonus performances. There is no good reason to run for the table as soon as your strategy is exhausted. There is no real downside to getting to the table after the whistle has blown to end point accumulation. You might take another shot at trigger and bonus. 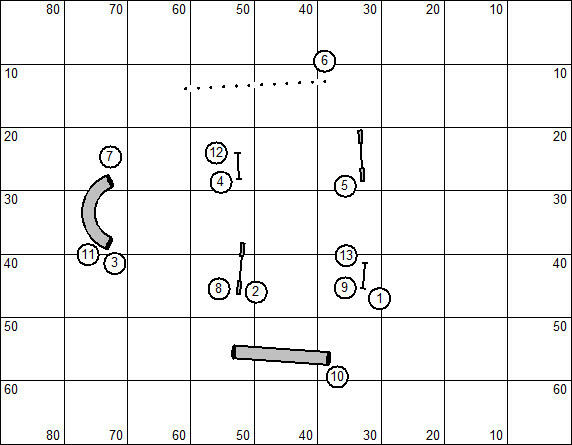 Or, at the very least, continue accumulating points for the simple performance of obstacles until the whistle blows. It’s a funny thing. I went into this pretty much imagining that I had figured out the killer strategy before the first dog had run. Here’s my logic… since it takes 150 points to qualify at the GIII level… then it makes sense to collect pretty much precisely just enough in the opening salvo so that it would add up to a qualifying score if tripled only twice. That would be I figure 16 or 17 points. And then, as we diligently pursued this line of reasoning… all of our dogs timed out smack in the middle of the third tripler. We sat and pondered this for awhile and arrived at an interesting conclusion… It would be considerably better points-wise to go into the bonus period with a more modest accumulation of points, say 10 or 12. That will allow time to get the third tripler. That means instead of having a score hovering just above 150 points… the dog would have a score more in the range of 350 +. Now, what you have to take into consideration is that we were not running on a TDAA course. We were running on a big dog course. So had we all scored our third tripler using the initial logic… then our scores would have been more in the vicinity of 450+ points. We learned some other interesting things as well… like why it doesn’t pay to melt down when the judge calls a fault. This was a very cool game and likely a keeper in the TDAA. Pinball Wizard is often confused by judges/course designers with Wild West Pinball. So it will appear in the world with elements of the latter game utterly distorting and obscuring the original Margaret Hendershot game. Timing Variation ~ time begins when the dog dismounts the dogwalk… rather than when the dog commits to the dogwalk. Pinball Wizard a dog’s choice point accumulation game with on-the-field bonuses that triple all of the dog’s points. The game starts with a performance of the dogwalk; rather like pulling back the plunger on a pinball table before releasing the pinball onto the table and racking up points. Do tell… what’s Guy Clark’s most famous song? 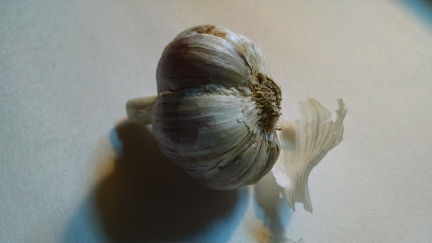 This is heirloom garlic given to me by Cookie Nee. She gave me something else that I’ll always remember. She says, “In the ground on Columbus Day, and harvest on the Fourth of July!” This is like old farmer timing wisdom… and is easy to remember. The timing has always been a complete mystery to me. There are agility handlers who have difficulty with so-called “dog’s choice” games because a path has not been clearly plotted for them. It seems a bit unsettling to randomly and haphazardly commit the dog through the performance of obstacles. The key to a dog’s choice game is that it should be resolved to a plan as clear and precise as any numbered course. The following rules for Tag 10 are a preview to those that will be used at the Petit Prix being faithful to the inventors’ (Martin Gadsby and Lisa Brownschilde) original vision of the game. Small dogs will have 60 seconds, Big dogs 55 seconds for each team to accumulate as many 10-point sets as possible. at which time the team should quickly “tag” to stop time. Each 10-point set must be unique. The team may not repeat a sequence—either forward or in reverse. Dogs cannot take the same obstacle back-to-back. They can take the same obstacle twice (and only twice) in a sequence as long as a different obstacle is taken in between. Tag 10 is scored points then time. Time is a tiebreaker only. Each 10-point set earns the team a score of 1. If the team “tags” after a non-unique set, the judge will call “COPY” which means that set does not count. If the dog Tags with more or less than 10 points, no points for the set shall be awarded. The judge may call “TAG”; but it’s not the judge’s job to do the math. The score-keeping table will sort out the bodies. If the dog is in the middle of accumulating a set when time is called, the points earned in that set will be converted to a decimal score. 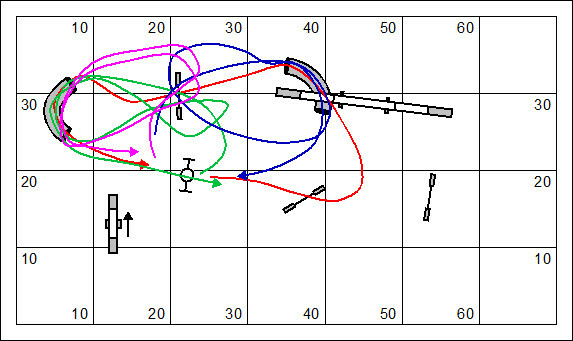 For example, 4.6 points are earned for the fourth attempted set in which 6 obstacle points were accumulated. If the team does not stop time by “tagging,” they will keep their points but their time will be 999 seconds. If a dog faults an obstacle, no points are awarded for that obstacle. The dog must perform another obstacle before repeating the faulted obstacle. If a bar is dropped the jump is out of play. 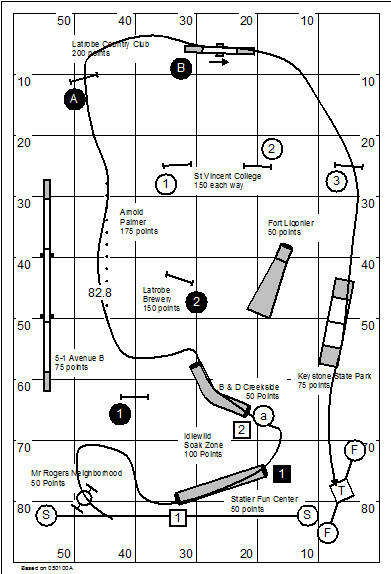 This is not the actual Tag 10 course that will be run at the Petit Prix. 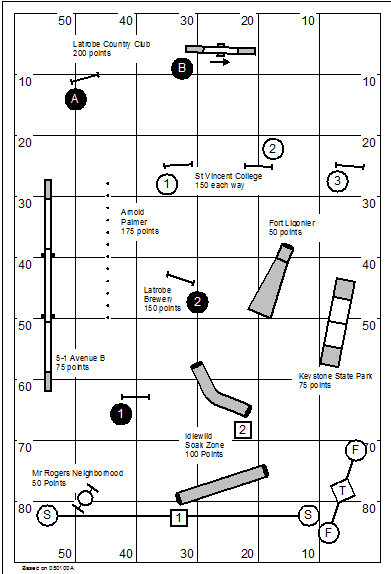 Jumps = 2 points and tunnels = 3 points; So, two tunnel/jump combinations = 10 points. Five jumps = 10 points. You can’t make five points with jumps alone. You can’t make five or 10 points with tunnels alone. If you score three tunnels, you are in a pickle. There’s nothing else to do but Tag away the tunnels (even though you lose all the points). Don’t waste time standing in the middle of the ring pulling your hair out. Your strategy for the game must be to find something smooth that delivers up blocks of 10 at your dog’s best working speed. Any fifth grader can make combinations of obstacles that add up to 10 points. It is the master handler who recognizes those that are quick business. Two things to take into consideration in a point accumulation game like this will be the economy of the path and the relative difficulty of the obstacles on that path. Take the fastest smoothest books of ten first. There is no sense in going after tough tens with there are quick tens to pick up by the bushel basket. The thing to do, then, is plot as many unique 2-tunnel and 2-jump sequences as possible as the opening gambit. When these are exhausted look for a technical obstacle paired with a jump and tunnel. And finally look for two technical obstacles. Given this strategy, we’ll use the sample course to visualize what the dog might do in 55/60 seconds. 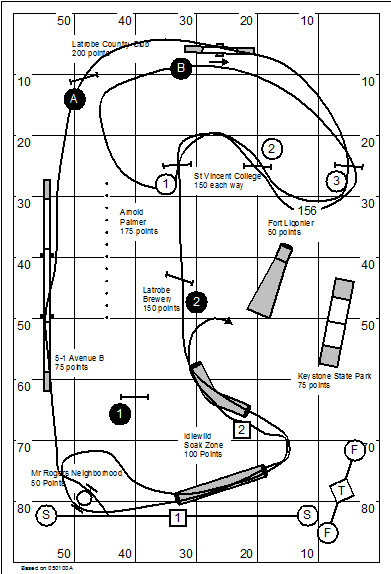 On this course are three tunnels. The entry to the collapsed tunnel/chute is so far removed from the rest of the action it should probably be used only once during the 2-tunnel & 2-jump part of the strategy. One of these two paths might be the smoothest opening of the course. Be aware that the transitional distance between these books of ten, to and from the tire, may decide the winning score in Tag 10. The judge has a mind like a steel trap and will call “COPY” if you repeat a sequence either forward, or in reverse. 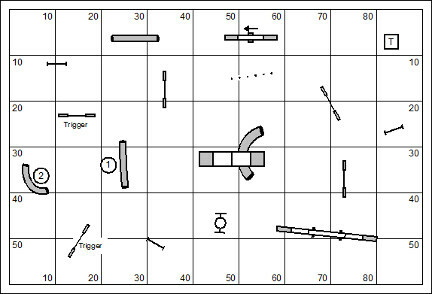 On the sample course envision at least four unique combinations for the two-jump & two-tunnel strategy after the opening. The plan must insist on conducting all of these, because these will comfortably produce the points required to qualify at the Games III level. At this point you have all of your fast and easy books of 10. Now you plan to work until somebody blows a whistle. In your plan, visualize the books of Ten with the longer path and using the technical obstacles. Failing to have a plan will leave you flat-footed and feeling silly (in front of God and everybody). When they blow the whistle… head for a last “Tag” of the tire. Don’t dawdle in this last moment. You can bet a lot of dogs have your dog’s exact score… and time is the tie-breaker. We’ve taken a new dog into our home. The dog is 7 weeks old (and a couple days now). This event immediately launches a variety of structured activities and responsibilities. If you have the opportunity to look at a litter you might take a bit of time doing temperament testing to find just the right dog for you. The bigger the litter the better the odds, I suppose. But we took this girl sight unseen and trusted to the gods in this luck of the draw. I’m happy to report that this girl is bold and curious and appropriate. She can also be loud, by the way, something I attribute to the Sheltie genes in her. A rational person might question whether you really want to teach a young dog to tear up your socks. We’ll make sure that she has ample access to more appropriate playthings as we go along. As you can see, she appears right in the middle of the grey area at week 7. 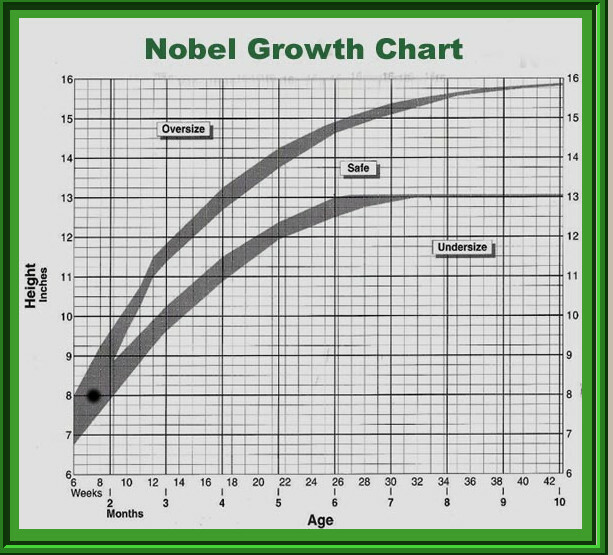 I’ll measure again on Week 8… and then measure every two weeks as the chart suggests. The conformation range for a Sheltie is between 13 and 16 inches. 16 can be serendipitous because it’s the cut-off in the USDAA between big dogs and small dogs. I feel no real pressure with this girl to make her into anything that approaches an ego boo. This is important from the onset. I do not need a dog to validate me. Que Sera Sera! What most fascinates me is taking her through the distance training methodology that I fine-tuned with Kory when he was a pup [documented in the pages of The Joker’s Notebook.] The dog trainer should be very conscious of the differences between dogs. And one of the chief differences in Cedar is that she will have a brain no bigger’n a walnut. And so I will have to be more meticulous and granular in my approach to training. It’s easy for the Border Collie trainer to convince himself that he’s a friggin dog training genius, when it’s truly the keenness and compensatory nature of the dog that has all the genius bits. At any rate, I want a young fast dog who understands her job while working a magnificent distance from her old arthritic person. Marsha has objectives for Cedar as well. She’ll be meticulous in applying her two-minute-dog trainer magic. This discussion is intended for the dog agility professional engaged in training services as a business; providing training expertise, site, and equipment. The addition of agility league play to the business mix provides a supplementary income stream, attracts new customers, and enhances student retention. This business model is intended to provide an overview of dog agility league play, its income potential, and the business owner’s relationship with Top Dog Agility Players. Dog agility league play is intended to be a weekly competition. It can be (and should be) conducted in conjunction with agility classes. If the business has 24 students who will participate in league play, and they are charged $5 each week for their participation, in a year the business earns $6,240. Note that this is supplementary income and is not based on the recruitment of new students. If the business is a large training center the math can be extraordinary. If there are 100 students and they are charged $10 each week, then the annual income from league play amounts to $52K. Putting together an agility league in the training center can be an interesting logistical problem. You might have a staff of instructors who all have a different vision for training objectives for their own students. And you have students who come and go throughout the week on different days, at different hours. The simple approach would be to select a course or game and set the floor for the entire week with that layout of equipment. Give the layout to your instructors and challenge them to find their training objectives without moving equipment. The league play competition could be sandwiched between classes. For example, you have a one-hour class that begins at 6:00 pm; and another that begins at 7:30. To introduce league play you ask the later class to come a bit early. Briefing begins promptly at 7:00 pm, then walkthrough, then run the game. The later class begins immediately after the last dog has run and will have its own full hour. Top Dog Agility Players features a titling program that measures the skill and development of both recreational and serious dog agility competitors. This program can be conducted at the host clubs site without many of the associated costs and requirements imposed by other agility organizations. Top Dog provides incentive for your customers to participate in league play. Their achievements are recognized and celebrated by agility titles conferred for each dog’s performance in competition. If you would like to participate in Top Dog Agility Players league competition contact Bud Houston at Houston.Bud@gmail.com. We will endeavor to help you get your league competition up and running smoothly. Anyone (club, group or individual) may set up any or all of the Challenge Courses. For results to be recorded for this event the courses must be run in the month of September, 2014, and results must be reported by midnight on September 30, 2014. Questions comments & impassioned speeches to Bud Houston Houston.Bud@gmail.com. Visit the web store at: www.dogagility.org/newstore. Please note that the web store carries The Book of Agility Games. 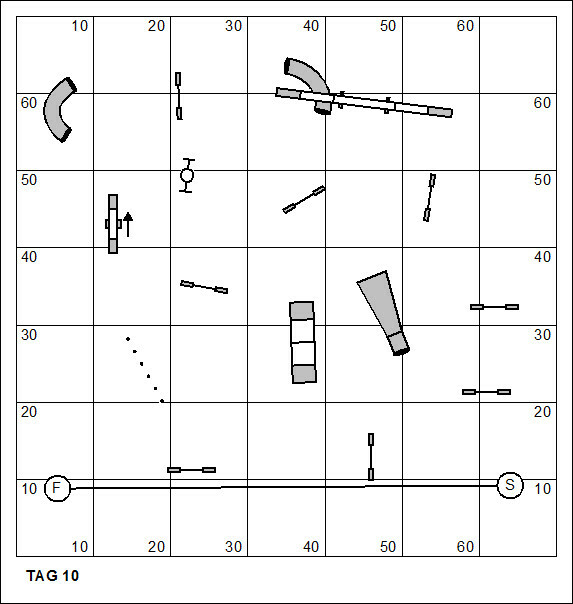 This is an important reference for any club who plays the variety of games that we’ll play in Top Dog Agility Players. Wild West Pinball is the invention of Ilze Rukis one of the preeminent agility games inventors in the world. The game was designed as a qualifying game in the TDAA for play at Decatur Dog Training Club in Warrensburg, IL on April 12, 2003. It is a game that is played today in the TDAA probably more often than the game deserves. Since it is a titling game I’m going to give it the rugged scrutiny that any titling game deserves. 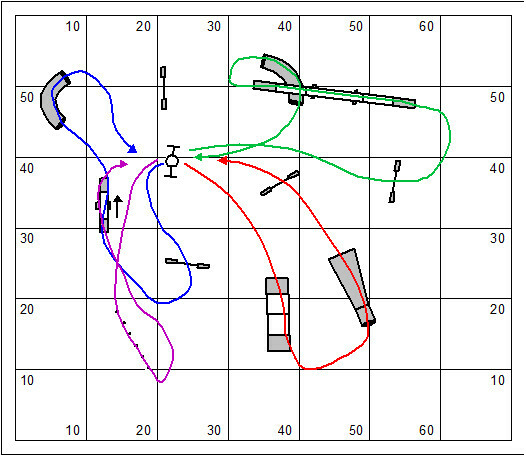 We should understand the game both from the course designer’s point of view, while helping the competitor understand how to approach the game. A discussion of strategy and preparation rightly belongs in the front matter. But the briefing gives context. After you’ve read that part… take a bit of time to read the analysis. If a fault is called, a fault will not affect previously accumulated points earned but no points will be awarded to a faulted obstacle. 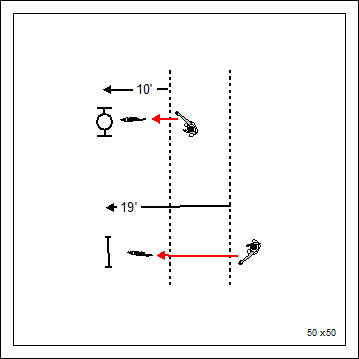 If a bar is knocked, it will not be reset during the run, making that sequence ineligible for points. All obstacles and combinations but the teeter combination and the collapsed tunnel are bidirectional. Idewild Soak Zone is 100; this combination is not only bidirectional but any which way. Just do the two tunnels one after the other, either entry, either tunnel. Latrobe Brewery and St Vincent College are 150 points. St Vincent college is not only bidirectional, but may be started from either side; just ensure that the jumps are performed in serpentine fashion. Arnold Palmer is 175 Points; the judge as stipulated that the weave poles must be performed as a continuous motion. If the dog pops out the weave poles need to be restarted from the beginning. Latrobe Country Club is 200 points. An obstacle that belongs to a “combination” can be taken for flow even though no points will be earned. 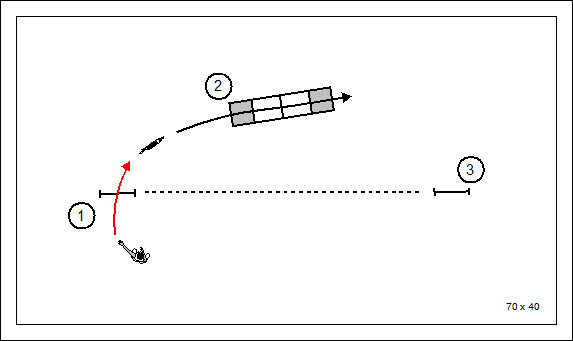 If a dog drops a bar when taking a hurdle that is part of a combination, then the combination is out of play for the remainder of the dog’s performance. Wild West Pinball is scored Points, Then Time. On first glance this is not a very serious looking game. The original game used colorful terminology like “Dog Bone Bonus”, “Cowboy Cliffhanger”, and “Gold Nuggets”. As the game emerged in the TDAA the local course designers engaged in a tradition for renaming the challenges for local color. So all of the terms and expressions you see noted on the course map are indigenous color for the region in which the game will be played. The point values assigned obstacles and obstacle-combinations are a bit on the wild side, and without much apparent logic. The exhibitor must look at this course map and feel a warning throb at the back of the skull as the brain gets ready to explode. TDAA competitors are among the great agility games players in the world. With a well-written briefing the canny handler will plot and scheme a path for the dog that will deliver a qualifying score at least… or maybe even win the class if it’s an exceptional plot and scheme. 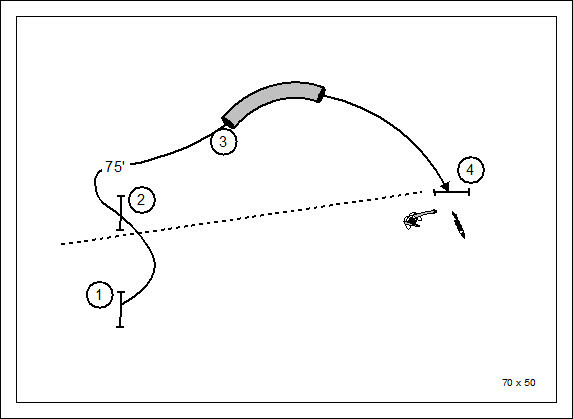 This is a strategy that delivers 600 points, precisely what is required to qualify at the Games III level. The path measures 82 yards which makes the strategy doable even for tiny dogs with legs that are only 4″ long. Editor’s Note: The example course was designed for big dogs. 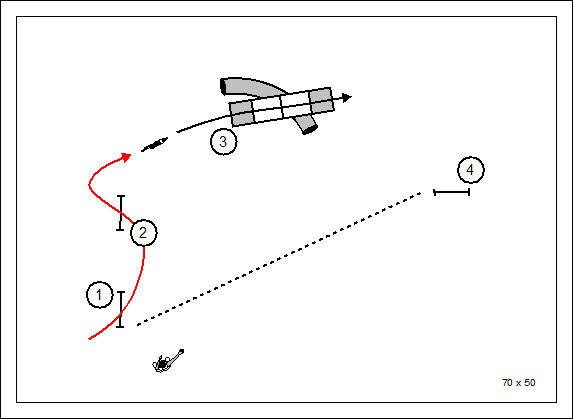 A TDAA course will have shorter transitions between obstacles and might very well allow for a higher accumulation of points in a shorter amount of time. The downside of the strategy plotted above is that it begs for the minimum performance. The dog might easily get to the table with time still on the clock. Since there is no real downside to going overtime, the handler should endeavor to keep the dog on the field and score points until they turn out the lights and kick everybody out (or, until the whistle blows). 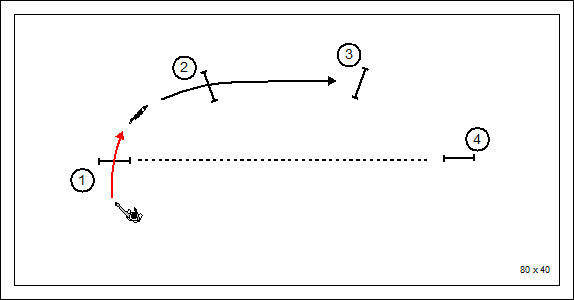 In this scheme and strategy I’ve repeated the very high scoring combinations at the back of the field. Once the dog gets through the second performance of the St. Vincent College serpentine, he has scored 825 points. Then he heads south to soak up points in the Idlewild Soak Zone until the whistle blows. The fun thing about games like this is that the handler can study to avoid those obtacles that are problematic for a dog. If the dog is terrified by the teeter… stay away from the teeter. If the dog doesn’t know how to weave… stay away from the weave poles. There isn’t much logic to the names of the elements of the course or the point values that are assigned to them. This is a game that calls for a judge with a mind like a steel trap… or clever system for crediting the dog’s performance. 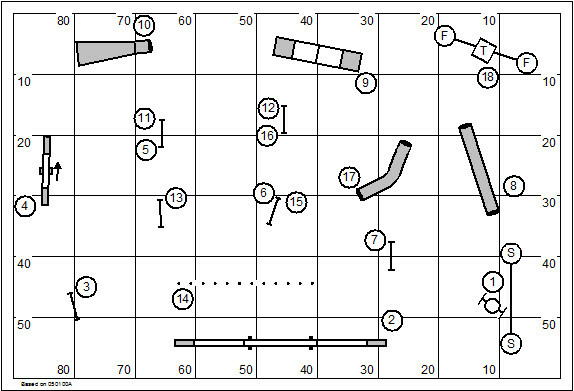 A system that might work is the use of numbered cones for the elements of the course. The judge wouldn’t have to keep track of either the names or values of any of those elements. He, or she, would simply call out the numbers in a linear representation of the dog’s performance. The score-keeping table would have a cheat sheet allowing the translation of those numbers into the arithmetic that makes up the dog’s score. I had already laid out the floor for our agility classes this week. And so I superimposed the Wild West Pinball over this set of the floor, with some modest tweaking. This short course features both sweeping flow and tight technical handling. Obviously (to me) there will also be an opportunity for good work at a distance. My older brother Travis Lionel Houston died eight days ago. I’ve been reluctant to share my thoughts and feelings on this. Some of those feelings won’t be shared. We’ll have to call them private demons. When we were children Travis was my best bud. He was certainly my greatest tormentor and defender; which means that he would have beat the crap out of anyone who treated me like he did. And from time to time, he did just that. Travis was the star of our family and the apple of my father’s eye. He excelled in athletics. He was a ladies man. He was a scholar. He had the world in front of him. On the other hand, I was none of that. By all accounts I was the black sheep of the family. And so by the hand of cards we were both dealt you’d have thought that the future was a predictable movie script. Travis demonstrated too early in his life a propensity for chemical dependency. You can call it a character flaw. I prefer to imagine that it’s a disease that he had no more chance of overcoming without proper care than the most malevolent cancer. For more than 40 years we hadn’t much to say to each other. He used to “borrow” a few hundred dollars from me every few months as his life moved from disaster to disaster. One day I cut all that off and I never again had much occasion to talk to him. He no longer had use for me. So now Travis has died. It was liver failure. If I understand the diagnosis his liver was making or allowing to be made horrible toxic chemicals that choked away his life. It’s not a risk. It’s a certainty. And you’re going to die a horrible stupid death before it’s actually your time to die. In the meantime you get to live in hovels and hang out with the worthless dregs of humanity… because they’re the ones who share your values. I actually cried when I heard the news. I wouldn’t have called that. It wasn’t for very long, and it wasn’t for the man who died. I cried for the child I knew the brother my old best friend with so much promise that forever shall be unfulfilled. We’ve just published the League Challenge Course for September, 2014. You can get all the details here: http://wp.me/p2Pu8l-2A. There might be three new league host clubs joining us in the month of September. It’s a slow but fun start. I’ve just returned from a three-day trial at B&D Creekside in Latrobe, PA. It’s late, and I’m tired. I’ll write more tomorrow. 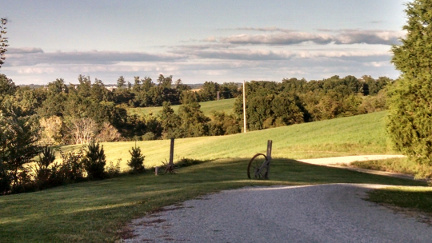 You are currently browsing the Bud Houston's Blog blog archives for September, 2014.